World 4-1 is the first course of World 4 in Super Mario 3D Land. Mario starts in an open area with Piranha Plants, Koopa Troopas, a tree, and a pair of Binoculars to find a Yellow Toad, that is on a tall stone pillar and rewards Mario with a 1-Up Mushroom. In an elevated area Mario will find a small pool with Goomba Towers and another Koopa. To the right side, the plumber will face Piranha Plants in rotating platforms, that are used to reach in a trampoline to get to the top of the mountain. There are bouncy platforms and a Super Note Block above a gap. In the other side, Mario will find a Koopa Troopa and a bridge with Biddybuds that lead to a big tree. In this tree, he will find a Chain Chomp, a red ring and another orange platform, used to reach on the next story of the tree. In the next story, Mario will face two Piranha Plants, a thorny flower and two jump platforms, one leads to a small groove with a green + Clock and the other to the next area. This area is a spiral path with many Para-Biddybuds, thorny flowers and another groove, now with three blue Clocks. At the end, Mario can jump to the treetop area, that contains a way conducting to the right. There, the plumber will find a bouncy platform and Para-Biddybuds surrounding the Goal Pole. 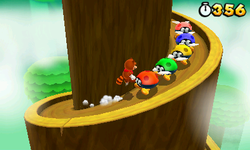 At the first part of the level, on the right, at the bottom of the ridge, a lone Propeller Box can be found above a tree, which mario can use to fly around. Star Medal 1: At the beginning of level, the travel up left. Near the small pool with the Goombas smash the small brick open with Tanooki Mario's tail or Mario can just somersault. Then crouch and grab the medal. Star Medal 2: Near the orange bouncy platforms is a Rainbow Block. Jump on it and retrieve the medal at the end of Coin Heaven. Star Medal 3: Right next to the checkpoint there is a cannon. Flutter kick over and hop in it. This page was last edited on April 5, 2019, at 18:10.